Thanks to bipartisan support, reasonable compromise, and all of your kind words and encouragement, my bill requiring reasonable fees for jail phone calls (LB 776) is one step closer to becoming a law. With this bill, county jails may no longer charge exorbitant phone fees to inmates and their families. Under this amended bill, phone calls that cost as much as $19 for a 15 minute phone call will be capped at $1.50. If we keep family ties strong, inmates have a drastically improved chance of rehabilitation, their kids have a much stronger chance of avoiding the prison pipeline, and all can become positive, contributing members of our community. Another important aspect of this bill is maintaining confidentiality between inmates and their lawyers. In the past, phone calls between the two have unconstitutionally been recorded. My bill seeks to end this practice. The advancement of this bill is a testament to government working properly, free of the drama and ego we typically see from our federal government in the news. I have always been a strong advocate for fair market principles. Unfortunately, these principles have not been upheld in certain Nebraska county jails. Private phone companies, under contract with some Nebraska counties, are exploiting incarcerated individuals and their families by charging exorbitant prices for essential telephone services. In some cases, these phone companies (and the counties they serve) are even compromising lawyer – client confidentiality and the right to a fair trial by unlawfully recording inmate conversations. My bill, LB776, seeks to remedy these glaring issues. Read more at http://journalstar.com/opinion/columnists/article_86cb7e2c-6268-5d0b-af7b-e25a3178ce52.html and join our team on this website! I officially filed for reelection yesterday. I thought you might like to see the press release! OMAHA, NE -- Yesterday, State Senator John McCollister (District 20) officially filed for re-election to his seat in the Nebraska Legislature. 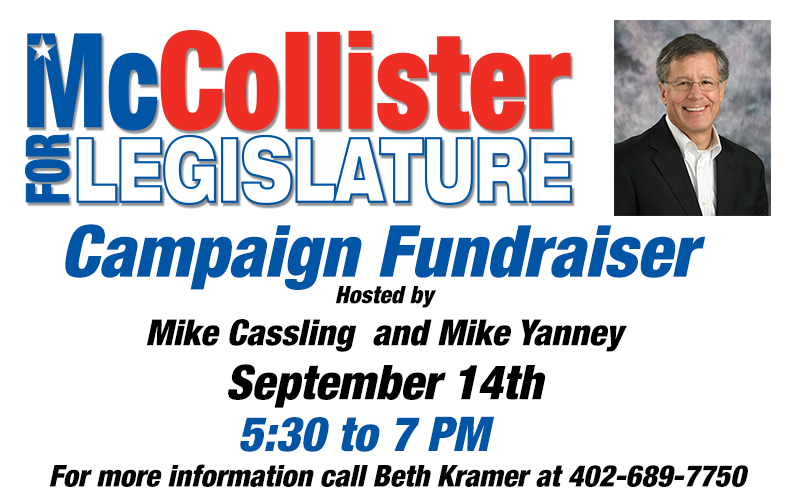 McCollister was elected to represent the 20th District, which covers central Omaha, in 2014. While in the Nebraska Legislature, Senator McCollister has been a recognized bipartisan leader, advocating for our military families and veterans, children, and taxpayers. McCollister has also worked tirelessly passing key legislation to provide more oversight and transparency of state tax dollars. McCollister is a graduate of Omaha Westside High School and the University of Nebraska-Lincoln with Bachelor’s Degree in Business Administration. McCollister has been involved with the Scouting program for more than 50 years and served as a Cubmaster, a Scoutmaster and as a Council officer. He currently serves on the OneWorld Health Center Board of Directors and the University of Nebraska-Lincoln’s College of Business Administration Advisory Board. McCollister married Deborah Way in 1971 and they have three children: Lauren, Daniel and Jeffrey, and two grandsons, Andrew and David. As we approach the end of 2017, I’d once again like to thank everybody for the wonderful support you’ve shown me. I’m a firm believer that we need more straight talk, hard work, and common sense in all branches of government, and I’d like to continue to bring that to the Nebraska legislature. If you agree, please chip in whatever you can at https://goo.gl/ExaCQ5 and I’ll keep fighting for these pillars of smart, efficient, and effective government. Have a happy new year, stay safe, and I’ll see you in 2018! Research confirms that when prisoners keep in touch with their families, they are less likely to commit new criminal offenses. This is particularly useful information for Nebraska, where nearly 41,000 children — one in 10 — have a parent who is incarcerated or has been in jail or prison. Unfortunately, county jails charge exorbitant fees for inmate phone calls, and this burden often falls upon the prisoners’ families who already struggle financially. Addressing this issue, the state Department of Corrections provided a model for reasonable call costs, capping 15-minute phone calls at $1.50, instead of the egregious $0.99/minute rate we see in Saline County for example. I plan to introduce legislation in January to cap county jail call costs in a similar manner. Let’s remove these outrageous fees on poor families and rehabilitate prisoners, rather than recycle them back into the system. Everybody wins when they become a positive force in our community. Everybody wins when we grow together. Earlier this week I shared two of my focus points from the 2017 legislative session; one successful bill that brought sustainable, responsible, green growth to Nebraska, and one common-sense bill that did not pass (although I have high hopes for the passing of similar legislation in the forthcoming session). In today’s look at my 2017 legislative focus points, I’d like to share LB 564. We physically go to stores far less often than we used to. We much prefer the convenience of online shopping, typically from out-of-state sellers. This is wonderful for obvious reasons, but as it stands there is no sales tax legislation by which these remote online sellers need abide. The money Nebraska would typically collect from these sellers no longer stays in Nebraska’s economy. My bill LB 564 would enact the Nebraska Main Street Fairness Act to address collection of sales/use tax on sales made by out-of-state internet sellers from Nebraska residents. Out-of-state online sellers that complete more than 200 transactions with Nebraskans, or that collect more than $25,000 from Nebraskan patronage will pay sales taxes to Nebraska. The way we buy things has evolved, and I believe we must pass LB 564 to adapt coherently with today’s marketplace. Stay tuned for more updates, and be sure to join our team, or make donations to the campaign. I’ll be knocking on doors throughout district 20 in the coming weeks, and I look forward to seeing you! 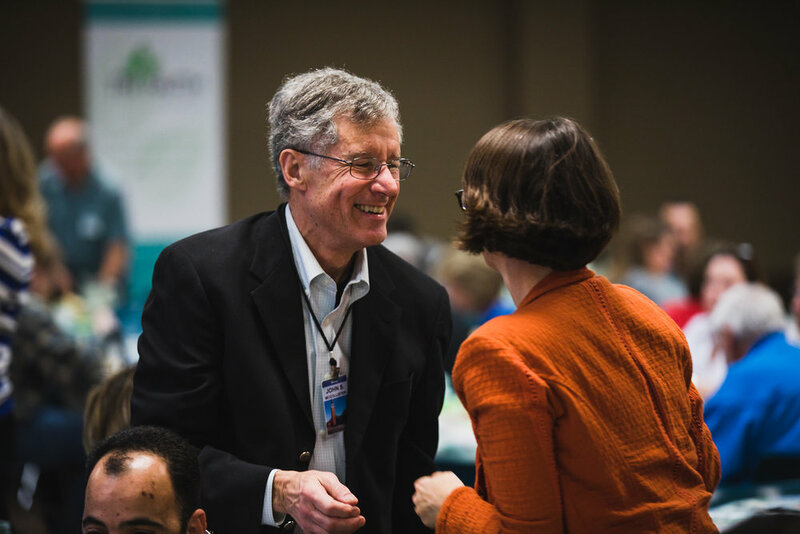 It’s hard to keep up with what happens in local and state politics, especially in our polarized climate. This week, I’m sharing my main focus points from the last legislative session to inform you, and hopefully diffuse our polarity with this information. A few days ago, I shared a wind energy bill that I introduced. It thankfully passed, and has allowed wonderful state growth as a result. Today I’d like to share a focus point of mine from this year that was defeated on the floor. LB358 was a proposal for a gradual transition in SNAP benefits. The Supplemental Nutrition Assistance Program, or SNAP, is a successful program that helps hard-working, struggling families put food on the table. This assistance is critical, but it should also be temporary and transitional. As the program’s benefits have a specific threshold of income eligibility, families are often forced to choose between taking a raise or a better job and losing these benefits and being able to put food on the table. This is known as the “cliff effect”. My bill sought to make this transition more gradual, allowing these families to take promotions and still feed their family. It was unfortunately defeated on the floor, but I look forward to working with my fellow state senators to pass similar legislation in the name of common sense next year. In my last newsletter message, I indicated that the 2017 legislative session did not go well, and that the partisan approach produced fruitless gridlock like we often see in Washington, D.C. and many other states. I hope for an improved atmosphere in the Capitol and more appropriate representation of Nebraska citizens in the next legislative session. In the coming week, I’d like to outline my personal focus points for last year’s session, and my intentions for the work we still must do. As always, you can join our team with a donation of time or otherwise on this website, and join me at The Market Basket tomorrow for some coffee and canvassing! Along with our abundant groundwater resources, Nebraska has a very special above-ground resource – wind. This bill, which I introduced and saw passed in 2016, allows wind energy companies to thrive in Nebraska by removing 1930’s regulatory barriers. Nebraska has since joined the “Gigawatt Club” by topping 1 gigawatt of wind-generated energy, poising us for more fiscally and environmentally sound infrastructure. For example, Facebook recently announced its intention to build a new data center in Papillion, using 100% renewable energy. We'll be rallying support this Thursday! I would love to see all of your faces there!